During the last century Kylie became popular in Australia as a girl’s name. Two of the most famous Aussie Kylies are Kylie Tennant (1912–1988), the author of novels such as The Battlers (1941) and Ride on Stranger (1943), and Kylie Minogue (b. 1968), the actress and singer. When I first heard this I immediately searched online sources and the Australian National Dictionary Centre’s databases to see if the word was being used more widely. 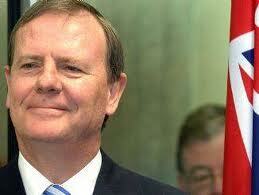 To my disappointment the only evidence was from this one speech by Peter Costello. So the treasurer’s reference to Kylie as ‘in the parlance’ was perhaps a cute way of disowning his coinage of the term. On hearing it again some ten years later I went back to the online databases to see if it had taken hold in Australian English. Again it was being used by Peter Costello: ‘Then he thanked the Opposition for asking a “Kylie” – an “I should be so lucky” question giving the Government a parliamentary free kick’ (Adelaide Advertiser, 2 Dec, 2004). Other evidence was slim and used self-consciously, as in this example referring to Reserve Bank Governor Glenn Stevens and inflation rates: ‘As I wrote yesterday, 0.8 per cent would have been “interesting”. And would have left Stevens “wishing for a Kylie” (I should be so lucky)’ (Melbourne Herald-Sun, 29 July, 2010). The evidence for the new usage of Kylie appears to be largely confined to Peter Costello or media reports of his use of it in Parliament, and it is always accompanied by the line ‘I should be so lucky’. It is not used widely, and it has not become an established Australianism. It is unlikely to do so while the word remains tied to the song title. This entry was posted in ANDC, etymology, new words, politics, women and tagged boomerang, kiley, Kylie by Mark Gwynn. Bookmark the permalink. I am of course operating from a position of complete ignorance, but it occurs to me that the senator called the question a “kylie” because, like a sport boomerang, it bounced off his oblivious surface, making no reply necessary? Treasurer Peter Costello in Parliament yesterday responds to a question from Deputy Opposition Leader Gareth Evans. Unfortunately I had already posted this blog before this quote came to light. The word ‘kylie’ meaning boomerang is not very common in Australian English these days – databases covering the last 20 years show that it is rarely used and usually has to be explained. Thanks for your comment and the opportunity to provide this earlier evidence.